Now working with clients in Portland, Freeport, St. George, Maine, Florida & Baja, Mexico. Winter Office: January through March Please use my e-mail for contact. 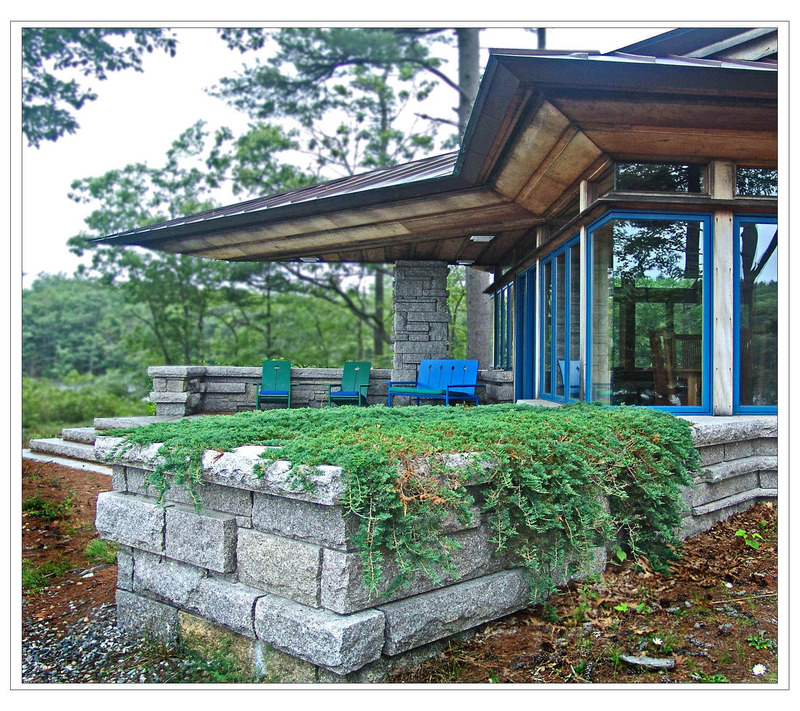 Residential architecture inspired by my clients and the natural sites on the coast of Maine. Houses large or small, designed to your life, your site and your budget. Click above to view my Houzz web site. Residential design and more photos. It costs nothing to ask your questions. Call or send me an e-mail. You are an individual and the house we design together shall reflect your individuality. I offer my design talent and years of construction experience building on the Maine coast. I have worked with many of the best builders in the state of Maine and would be pleased to make recommendations for your project even if you do not use my architectural services. Call me or send me an e-mail. Contact me to learn the secrets of how I conceive and design my architecture. I will share what I have learned with you. Please put " ORGANIC" in the subject line so I don't delete it as SPAM. FREEPORT, MAINE HOUSE, Building permit August 8, 2008. Construction layout started at the site 8/18/2008 with completion 11/12/2009. Construction completed under budget and ahead of schedule in 14 months. Solar Systems used in the Freeport House for solar electric and heating. 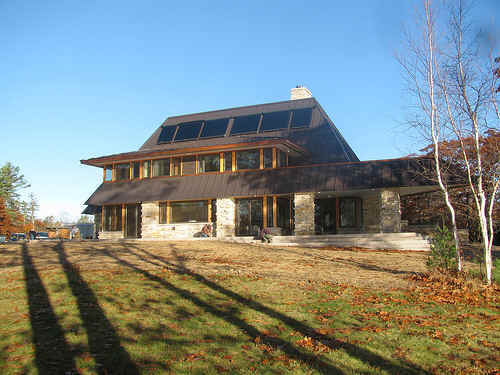 The solar thermal provides domestic hot water and supplemental space heat. The collector array on the south roof consists of 160 Apricus evacuated tubes. The array is mounted at 60 degrees to horizontal to optimize performance for space heating. Two 160 gallon Stiebel Eltron dual coil tanks are used to store the thermal energy for domestic hot water and for space heat. There is a 5.4 kW Photovoltaic array on the southwest roof of the house consisting of (24) 225 watt Sunpower modules. The modules feed power into a Sunpower 5000 watt inverter. The inverter will feed roughly 6200 kilo-watt hours of electricity per year into the house and/or the power grid. See more photos of Freeport House by Keith Wehmeyer carpenter and photographer, link below. 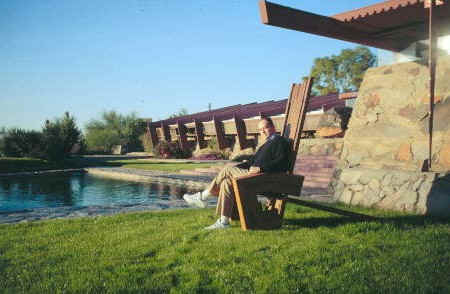 As an Architect I have worked with many excellent builders since 1971 and Brian Huey is one of the best. The Guest House: Construction is complete. http://www.dohertybuilt.com/ Contact the builder Christopher Doherty. 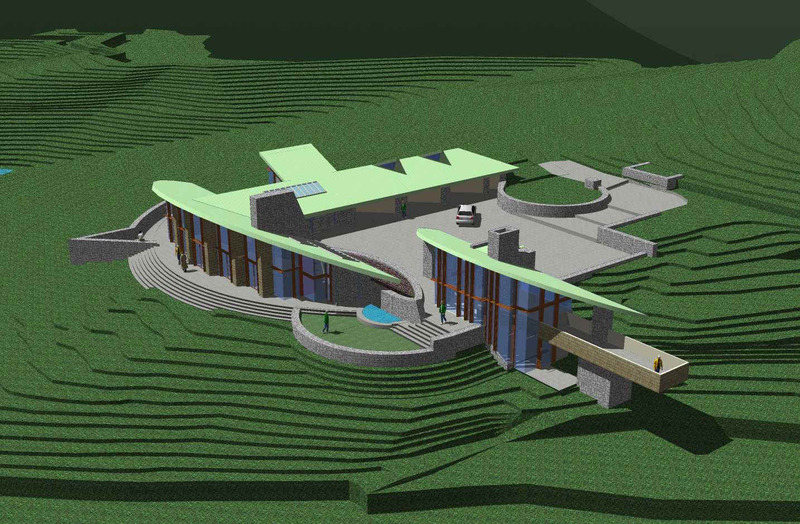 Concept design for Central Cottage Lodge Complex presented December 1, 2006, read description of the design at West Virginia and see more images. Contact the builder Christopher Doherty. See more of this great house click here. CLICK AT TOP or BOTTOM OF ANY PAGE ON Built Projects for MORE PHOTOS of this House and others. The Wright Stuff, 4 Sense of Place, Maine's modernest design visionary. See page 222, House of the Month, High living with a view to forever in Bar Harbor. "Imagine the Perfect Lake House" article in the July/August 2005 issue of PORTLAND MONTHLY MAGAZINE. Click above to read each article. What is Organic Architecture? Click and read. STUDENT DESIGN WORK as a student at the UNIVERSITY OF OKLAHOMA 1961-1966. I still do the renderings by hand drawing because it is faster and my clients like the art work better than a computer rendering. This Web Site was first published, November 23, 1998. It is a look at my architectural work and the philosophy from which it is created. Don't miss the other parts of this Site: Built Projects, Unbuilt Projects, History, Essays, Services and, Autobiography pages. Just click on the link names at the top and bottom of each page. Winter Office: January 15 through March 15 Please use my e-mail for contact.